On The Road, written in 1951 and published in 1957, is an autobiographical novel by Jack Kerouac. ...the only people for me are the mad ones, the ones who are mad to live, mad to talk, mad to be saved, desirous of everything at the same time, the ones who never yawn or say a commonplace thing, but burn, burn, burn like fabulous yellow roman candles exploding like spiders across the stars and in the middle you see the blue centerlight pop and everybody goes "Awww!" There were the most beautiful bevies of girls everywhere I looked in Des Moines that afternoon — they were coming home from high school — but I had no time now for thoughts like that and promised myself a ball in Denver. Carlo Marx was already in Denver; Dean was there; Chad King and Tim Gray were there, it was their hometown; Marylou was there; and there was mention of a mighty gang including Ray Rawlins and his beautiful blond sister Babe Rawlins; two waitresses Dean knew, the Bettencourt sisters; and even Roland Major, my old college writing buddy, was there. I looked forward to all of them with joy and anticipation. So I rushed past the pretty girls, and the prettiest girls in the world live in Des Moines. We lay on our backs, looking at the ceiling and wondering what God had wrought when He made life so sad. 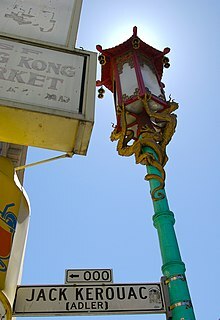 And oh, that pan-fried chow mein flavored air that blew into my room from Chinatown, vying with the spaghetti sauces of North Beach, the soft-shell crab of Fisherman's Wharf - nay, the ribs of Fillmore turning on spits! Throw in the Market Street chili beans, redhot, and french-fried potatoes of the Embarcadero wino night, and steamed clams from Sausalito across the bay, and that's my dream of San Francisco. In 1942 I was the star in one of the filthiest dramas of all time. I was a seaman, and went to the Imperial Café on Scollay Square in Boston to drink; I drank sixty glasses of beer and retired to the toilet, where I wrapped myself around the toilet bowl and went to sleep. During the night at least a hundred seamen and assorted civilians came in and cast their sentient debouchements on me till I was unrecognizably caked. What difference does it make after all? — anonymity in the world of men is better than fame in heaven, for what's heaven? what's earth? All in the mind. What's your road, man? — holyboy road, madman road, rainbow road, guppy road, any road. It's an anywhere road for anybody anyhow. Where body how? This page was last edited on 28 June 2017, at 02:10.